According to Matthew Wood, garlic is one of the most important and most ancient, widely known and universally applicable of all medicinal plants in the Old World pharmacopoeia. Wow! Garlic has been used for thousands of years as a general panacea. It is considered to possess 5 of the 6 primary taste in Ayurveda, lending to its wide ranging use. The active medicinal compound alliin has been isolated by modern research, justifying many of the traditional applications. Strongly warming and mildly moistening, garlic is beneficial for cold and dry conditions. Garlic contains sulfur compounds including alliin , enzymes, B vitamins, minerals, and flavonoids. The sulfur in garlic makes it a metabolic stimulant while the oil in garlic is nutritive. This nutritive quality makes garlic a go-to for cases of sympathetic excess where there is nervousness, anxiety, insomnia and weight loss. By balancing the sympathetic nervous system and moving the body more into the parasympathetic nervous system, garlic improves appetite, digestion, absorption, removes gas, bloating, colic, GI inflammation, lack of appetite, and anemia. Garlic improves digestion by increasing mucosal secretion. Garlic dissolves cloying substances and helps the body rid itself of them. Garlic is also antibacterial in an intelligent selective manner, killing foreign pathogens while supportive healthy intestinal flora. It does so by attacking the harmful bacteria directly and by changing the environment and eliminating waster material in which they thrive. The strong smell of garlic is due to its sulphurous alliin compounds that are stimulating, detoxifying and antimicrobial. Garlic improves digestion and stimulates metabolism while simultaneously killing foreign pathogens in the digestive tract. Garlic is well known for its use in cardiovascular health, in part by stimulating production of a substance that relaxes the arteries. To eliminate garlic breath simply nibble on some parsley. Garlic is best when used fresh, either cooked or raw. Eating raw garlic is generally recommended for treating bacterial infections whereas cooked garlic has a more digestive and immune enhancing effect. Tincture the fresh cloves (with skins) in 200 proof alcohol. A large amount of tincture or fresh garlic may cause an upset stomach, so be aware! This potent combination of herbs is a simple, quick and not bad tasting way to get rid of any hint of cold or flu if taken at the first sign of feeling ill. In a 1/2 pint jar, combine 1 to 2 cloves finely minced raw garlic, dash of cayenne pepper (or very finely minced pepper – use a tiny amount) and 1 cup grapefruit juice. Shake well. The grapefruit juice helps to mask the heat of the cayenne. Drink the mixture all at once. This mixture might be too intense for children, so be sure to start with small amounts of cayenne and garlic and to follow each dose with bread or crackers. This simple recipe takes almost no time to prepare and produces a delicious and healthy product that lasts for a long time. Essentially you are infusing the medicine of garlic into your tamari sauce that you might use as a condiment for any meal. Peel your garlic cloves and place in a jar. Cover the cloves with tamari, with about 2 inches extra tamari covering the garlic. Put a lid on the jar and keep in the refrigerator for about 1 month. After a month, you can eat the garlic (delicious) and use the tamari for cooking! 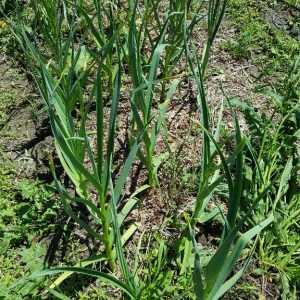 The garlic scapes are the flowering parts of the garlic plant which can be used like garlic. Place the garlic and herbs in a widemouthed glass quart jar and add enough warmed apple cider vinegar to cover them. Place the jar in a warm spot and let sit for 3 – 4 weeks. Strain then pour into a glass jar with a tight-fitting lid. Store in a cool, dark location, where it will keep for up to a year. To use: According to sources from antiquity, you can use Four Thieves Vinegar to protect against the spell of sorceresses, to ward off the plague and for endurance and protection. Take 1 to 2 tablespoons every 3-4 hours to ward off illnesses, and use liberally as a flavoring agent. Cautions/Contraindications: Garlic is contraindicated with hot conditions and nervous irritation including hot stomach and liver, hepatitis, pancreatitis, and hiatal hernia. May cause digestive upset in people with a weak liver. Eating excessive quantities of garlic may cause diarrhea.